Mulch. Garden accessories or a necessity? UK landscapes - mulched? Home Horticulture Mulch. Garden accessories or a necessity? Should UK public landscapes be mulched? Mulch. Garden accessories or a necessity? Should UK public landscapes be mulched? Australians Many Victorians in Australia love a good mulch. Mulch in all its various guises are essential in harsh climates. Mulch can not be viewed as mere garden accessories to be added at a later date. Water is so scarce that any successful planting bed without mulch is almost socially unacceptable. Water evaporation is just too high without some type of soil cover. No mulch and healthy lush green plants equals a Wally Water Abuser. That is totally unacceptable. When I started working in the UK I could not believe that large public landscape projects (budgets in excess of £500,000) did not have to specify mulch. No budget was allowed either. Mulch can eat up budgets and so its not something that you can just slip into a design at the very last moment. It needs to be incorporated into the concept plan otherwise there will be no hero landscape moments. A client is not going to be very happy if informed that the 50 metre long sculptural seating arrangement is being removed because we now need mulch. To me exposed earth looks naked. A part from its ability to save water mulch also acts as a weed suppressant and provides uniformity to the ground plane. Plus it reduces maintenance and can add nutrients to the soil as it breaks down. Despite the colder climate surely UK gardens and larger public landscapes would benefit from mulch? I would be interested to hear your opinions. Mulch comes in various forms including straw mulch, bark chips and cocoa shell mulch (which makes the garden smell like coconut for its first 2 weeks after laying). When selecting mulch there is a need to investigate the impacts of your proposed mulch material after it breaks down. Some mulches release certain chemicals into the soil or alter the soil’s PH. This natural composting process may adversely affect particular plant species. For example you would never use a eucalyptus mulch (known as ‘eucy mulch’ in Australia) on a garden bed of vegetables. It is not my intent to provide exhaustive information on this topic but rather to highlight that it pays to do a little research. Mulch can be worked into a landscape or smaller garden design to create a design feature. In fact mulch can be the major design feature. 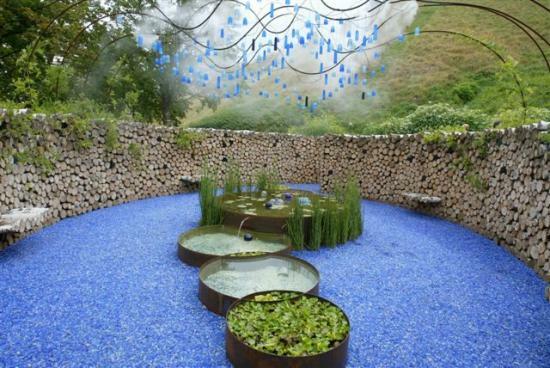 Fern Alder a UK landscape designer uses recycled glass in many of her projects including this project, Le Jardin pour la Paix in France. Here it is used as a major design feature. Photo by Fern Alder. Granitic sand is another type of mulch as illustrated below. 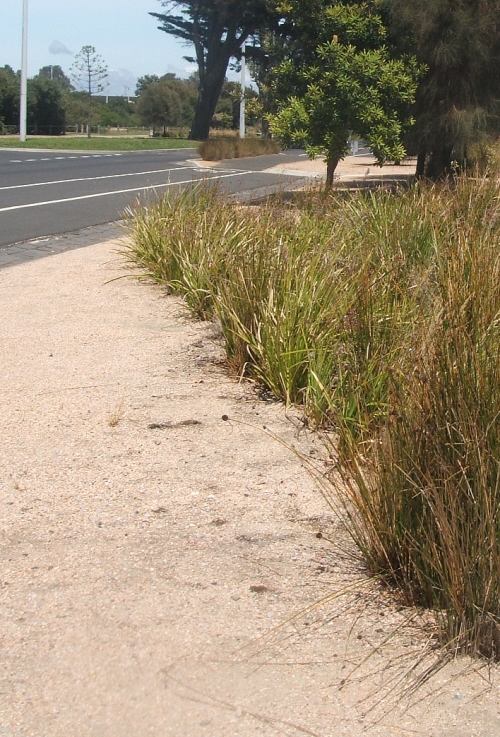 This mulch can also be used as a surface for pedestrians. It is therefore a very handy material if you do not want your planting beds to look separated from pedestrian areas. Plants appear to float. While done to death in Melbourne, Australia I still love a good strappy Lomandra longifolia appearing out of a granitic path.